The motorcycle event for women this Spring will be held in Denver May 2, 3 and 4th. 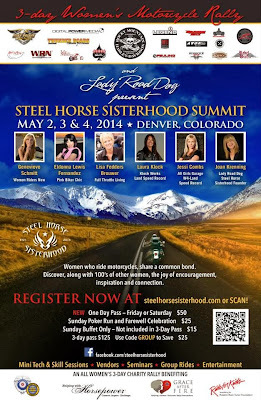 The Steel Horse Sisterhood Summit is a 3-day event with group rides, speakers, vendors, mini-tech and skill sessions, seminars and entertainment. Registration is still open and if you use Discount Code GROUP you will save $25. Visit their site SteelHorseSisterhood.com and get all of the updates.